The word “chronometer” has been around, as far as anyone can tell, since the early 18th century, when an Englishman named Jeremy Thacker used it in 1714 to describe a clock he claimed to have designed and built to aid in calculating the longitude of ships at sea. There were any number of competing solutions to the longitude problem at the time (ranging from the reasonably sensible to the extremely implausible, such as one that would have had a ship’s dog howl at noon in sympathy with a wounded dog on shore) and Thacker wanted to distinguish his clock from others, writing, “The PHONOMETERS, PYROMETERS. SELONOMETERS, HELIOMETERS and all the METERS are not worthy to be compared with my CHRONOMETER.” The term thus began as a marketing tool, although it gradually evolved to mean a specific type of escapement. For much of the history of watchmaking, “chronometer” meant a watch with a chronometer escapement, or detent escapement. Unlike the lever escapement, the detent escapement requires no oil at the impulse surfaces (the places where energy is actually delivered to the balance) and is more efficient, as impulse is given to the balance directly by the escape wheel rather than through a lever. It’s an ideal escapement for a precision ship’s clock, where a pendulum would be obviously unsuitable, and it is only the fact that it’s very sensitive to physical shocks that kept it from being more universally adopted in watches. Though there were many pocket watches made with detent escapements (the greatest names in classical watchmaking developed and refined the detent escapement, such as Le Roy, Berthoud, Arnold, Earnshaw and Breguet, and its principles are still considered the gold standard in escapement design today) the tendency of the chronometer escapement to unlock accidentally if jolted has largely discouraged wristwatch manufacturers from using it. The word, however, acquired considerable prestige, and gradually came to refer to any high-precision watch (though you’ll still find old-school horological purists who insist it’s incorrect to call any watch that doesn’t have a detent escapement a chronometer). The word today has a specific meaning defined by the international standard ISO 3159, which among other things defines the minimum criteria for performance for a watch to be deemed a chronometer. This includes a mean daily rate (as measured against a standard clock) of -4/+6 seconds per day, and a daily variation in rate of no more than two seconds per day. Though in theory, any suitably equipped third-party laboratory can certify chronometers, today, the vast majority is certified by the COSC (Contrôle Officielle Suisse de Chronomètres) with some also certified by the Glashütte Observatory, and the observatory at Besançon. 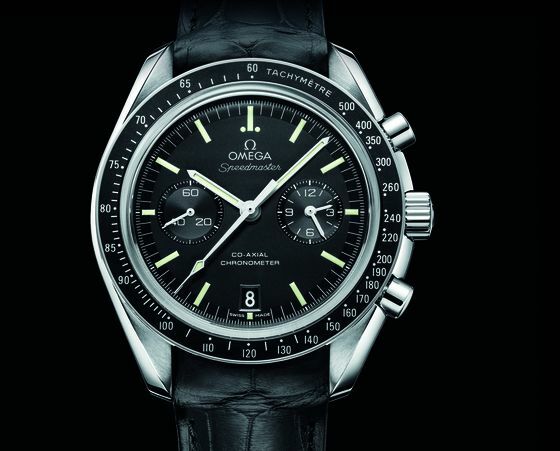 Additionally, a common pitfall that can be easily avoided is the confusion between a chronometer and a chronograph. The latter is a timepiece with timekeeping and stopwatch functions. The key to this lies in the Greek roots of the term — “chronos”, referring to time, and “graphein”, meaning to write. The earliest chronographs used drops of ink on revolving discs to mark off elapsed periods during timed events, hence literally “writing time”. Essential to the functionality of a chronograph is exacting levels of precision, which is why a well-made chronograph will frequently also carry chronometer certification. 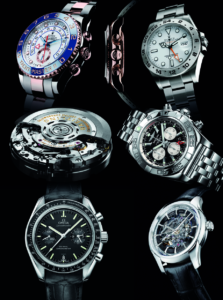 However, it’s immediately obvious that not all chronometers are chronographs — and vice versa. In 2010, the three brands that certified the most chronometers were Rolex, Omega and Breitling.